A new startup company Uwingu, which aims to offer an alternative funding source for space projects, is gearing up to launch its first product soon. 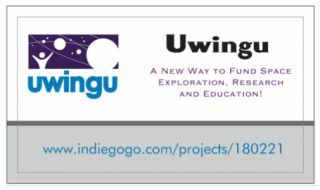 Uwingu, which means "sky" in Swahili, will aim to provide money for space exploration, research and education at a time when government funding is tight. To do this, the company plans to sell a series of products and use the revenue for science. The firm also raised startup money on the crowd-funding site IndieGoGo, surpassing its goal of $75,000 by an extra $4,896. Company officials have been tight-lipped about what kind of products it will sell, saying only that they plan to unveil the first by the end of this month or early November, and begin to sell it in early 2013. The firm will plan to launch new products periodically. "Every several months there'll be something new and different from Uwingu," Stern said. "We'll see what people like and respond to that." The first project Uwingu will fund is SETI, the search for extraterrestrial intelligence. The firm pledged to donate half of any money raised beyond the $75,000 goal in the IndieGoGo campaign to the SETI Institute's Allen Telescope Array (ATA), a set of 42 radio dishes in Northern California that are searching for signs of civilizations in the universe. "In fact, we've already cut them a check," Stern said. And SETI is intended to be the first of thousands of projects Uqingu hopes to fund, with a mix of many small projects and a few larger ones. "We'll pick some strategic projects like SETI," Stern said. "We expect most of the projects we fund to come from individual researchers or organizations who come to us with proposals." Uwingu is just getting off the ground, but already its founders are excited by the enthusiasm the project has been met with, including the flood of donations to the IndieGoGo campaign. "We worked in private just ourselves for a couple of years," Stern said. "It's been hugely motivating for us to go public and go campaigning and to see people backing it."